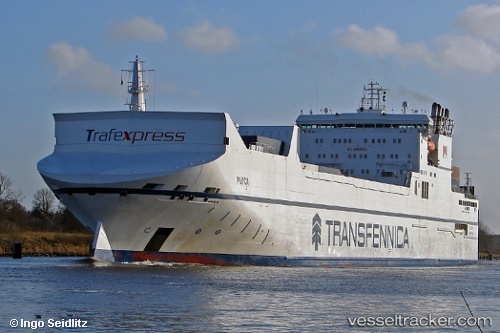 Transfennica now applying scrubbing system to five more vessels in its fleet. On Jan 21, 2012, at 11.40 p.m. the "Plyca" while passing the inland port of Brunsbüttel eastbound had so much speed off the TOTAL bunker station that strong suction and swell caused movements of the moored vessel "Tiwala"", Antigua & Barbuda flag, so that one of the ship's bow lines broke. The movement caused considerable damage to the gangway and a shelter with hose reels. The Water Police Station Brunsbüttel launched an investigation. The master of the "Plyca" had to pay a guarantee deposit of 175 Euro.